Thank you to Ernst Zollner, NZTA’s Regional Director, for the invitation to speak today. I would like to acknowledge the previous speakers, the Hon Paula Bennett and the Mayor of Auckland, Len Brown. I also acknowledge the apologies of the 2 local electorate MPs, Carmel Sepuloni for the suburb of Waterview and David Shearer for Mt Albert who are both on Te Tii Marae paying their respects and having a korero, as we speak. They have worked hard for this community. On behalf of the Albert-Eden Local Board who are present today, Chair Peter Haynes, Glenda Fryer, Graeme Easte and Helga Arlington, I would like to welcome you all to one of our local parks. This path will connect up several parks and spaces within the Albert-Eden Local Board area. It is also great to see support today from our Governing Body Member Cathy Casey who is a true local and a committed cyclist. Welcome. Today is the start of a project 10yrs in the making. Groups such as Friends of Oakley Creek, Cycle Action Auckland (now Bike Auckland), Tunnel or Nothing, the North Western Community Assn, local schools, the local kindergarten parents, the Mt Albert Playcentre, community groups and residents all fought to stop or bury a motorway. Backed by the Eden-Albert Community Board and its successor, the Albert-Eden Local Board from 2010, we all pulled together working collaboratively to get better mitigation for surrounding communities that could be impacted. Ironically, these groups all took their battle to the streets and court and won not only mitigation for their local community but for everyone across Auckland. I am glad I’m able to be here and was not arrested at the TPPA protests yesterday. That protest, like the struggle for this Shared Path, sent some pretty clear messages to the powers that be. I hope the Government took note and listened yesterday. Many in NZ are not happy with the TPP. Those protests, like those with the project we are finally commencing today, are always about the public good. 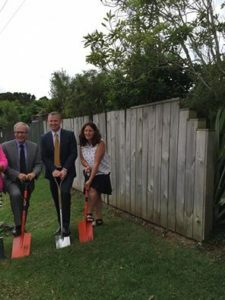 This Shared Path will connect Pt Chev, Waterview, Mt Albert, Owairaka, and onto Avondale and New Windsor. It provides access to alternative open spaces to mitigate for those lost through the SH20 project. And it is not just those suburbs but everyone who walks and rides for work, play, school, fun, fitness and leisure. Auckland will reap the benefits a very small group secured. So I must also acknowledge Judge Lawrie Newhook and the panel he led at the Board of Inquiry. He recognised that SH20 Waterview couldn’t be considered a transport project without a connection for those above ground and not using the tunnel… where rail, busy roads, the motorway and the divide that is Oakley Creek exists. He saw that this connection was critical. As a result we have more transport options – I do believe that decision has changed how NZTA have viewed their more recent motorway projects and pushed them to consider cycling and walking wins as part of their builds. So thank you to NZTA and AT (and especially Marcus Pillay) for working to make this happen. 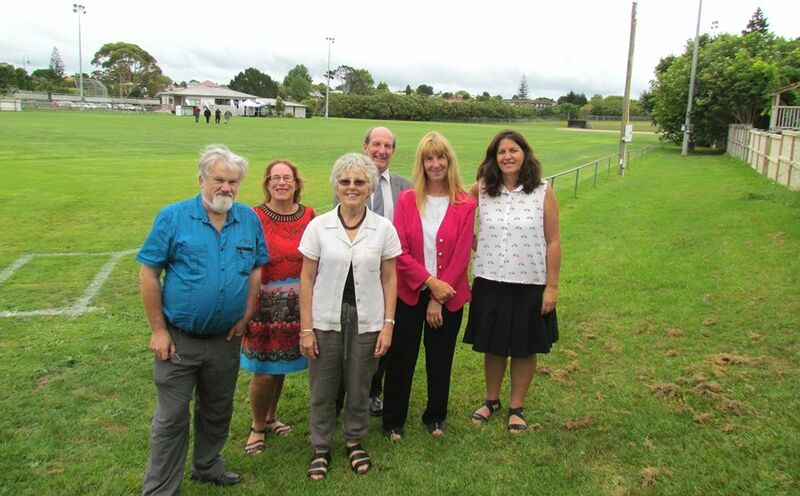 And to our colleagues on the Whau Local Board who, like the Albert-Eden Local Board, contributed some funds towards this project to help create links that go further than were planned. I am pleased that the Well Connected Alliance are undertaking the construction. They have proven themselves to be an exceptional team. Oakley Creek is a significant ecological and natural landscape – and I know they will protect and enhance it throughout the build. I hope that once the path is complete, I shall be able to ride my bike here from Waterview – without have to clamber up dirt track on the hill like I did today. Sod day is here. This project can’t come soon enough so let’s turn the sod and start.